Improvement in Digital Photography is less for the majority or very slow. The reason is nothing but the reflection of their own habits. Wishing you can improve. We want that you go proper improvement in Digital Photography. Every serious Author, Professional bloggers want that the general audience undergoes improvement in digital photography. It is true for any kind of skills, not only digital photography. From Darren Rowse to a forum member with lot of skills write about how to improve. But unfortunately the failure rate is quite high, specially among the new DSLR users. It was published before the high marketing of DSLM type of cameras, professionals still used Film SLR cameras. DSLR has underwent a huge technical improvement, but possibly the failure rate has been increased too in logarithmic scale. There is not a single reason to deny Darren’s logics. But we think, with time more factors has been added. Darren Rowse himself has very high perseverance, an inborn capability to understand and correct his wrongs. He indeed, defined a segment on the Internet. But, most new DSLR users now lack the major factor for improvement in digital photography, rightly needed for blogging too – Perseverance. First, most never read the good blogs on photography carefully. We can definitely tell it from our Analytics’ result – it is a kind of scanning and then clicking away to some unrelated topic. They came for a topic on digital photography to learn, but quickly scrolled it to checked it how big it is. Probably its too big, the Android section has more interesting things. Over 67% do it. They really read the Android things hours after hours. But they never check the whole section of Digital Photography. This simply means – their exception was, photography is quite easy, there is not much need to jam the head with theories. Second, DSLR is not a choice for the most. They buy it in the way some people buys a MacBook Pro 15″ – regardless of the actually. I use MacBook Pro for definite reasons. I need more battery life, I need a a well build compact material for a wider range of work. MacBook Pro is a notebook from premium segment for the professionals. I never needed them when I was a student. I do not need an iPad. Its an abnormal, useless thing to me. Understanding what I need is very important. These are not only technology stuffs or funny toys. They have big science behind. They ergonomics behind. If I somehow custom create a F1 car, it will be useless for me in the premium express highway. Products are becoming like buying a social status with vague ideas. Its impact is not very good to the society. DSLR has become like other popular ‘gadgets’. The news type of websites and blogs hugely promote them as if everyone is buying a EOS 650D and you are a backdated idiot. The thing this mass audience never knows – they get a huge money in various ways for writing it in that way. Third point is definitely simple ‘copy-pasting’ ideas. We say to watch others’ work to get new ideas, understand the fineness. We recommend to join Photography forums, submit to stock image websites – these are for getting criticized for improvements. As that 67% has not the time to invest behind learning photography, simply because it was a part of ‘status update’; ultimately the Photographs becomes black and white (to show a sort of artistic sense), with huge noise, basic mistakes with exposure. They tried to get a photograph exactly what they have seen somewhere. You must have already stopped reading before arriving to this sentence. So, now for the rest. There is really no quick and easy tips to undergo a huge improvement Digital Photography. The only scale to measure is by asking within yourself – why you bought the camera and at what points your current photographs are getting wrong. This Article Has Been Shared 6831 Times! 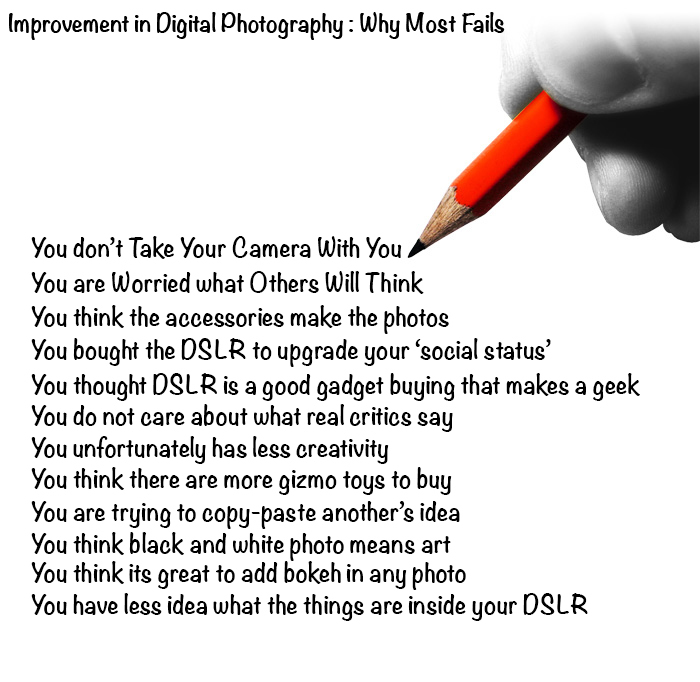 Cite this article as: Abhishek Ghosh, "Improvement in Digital Photography : Why Most Fails," in The Customize Windows, June 6, 2013, April 19, 2019, https://thecustomizewindows.com/2013/06/improvement-in-digital-photography-why-most-fails/.